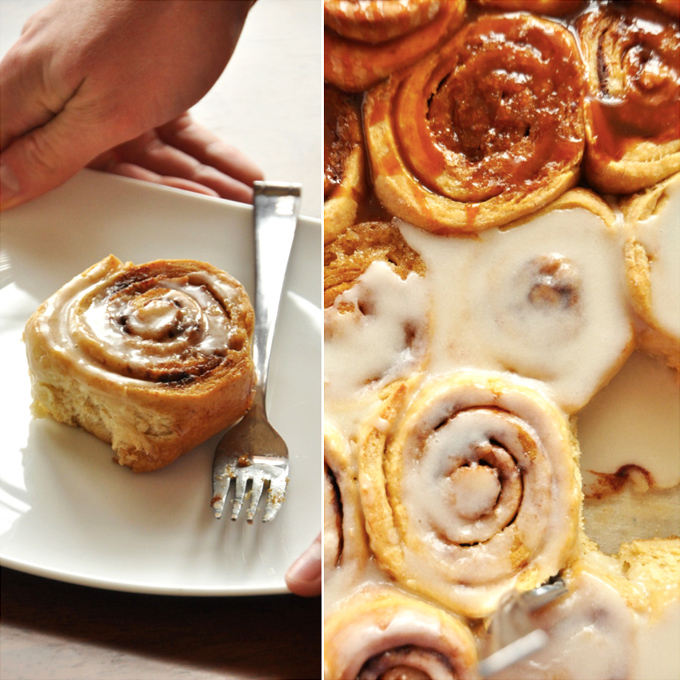 Ever thought cinnamon rolls were the most labor intensive baked good ever? Yeah me too, until this recipe came along. You know what else? 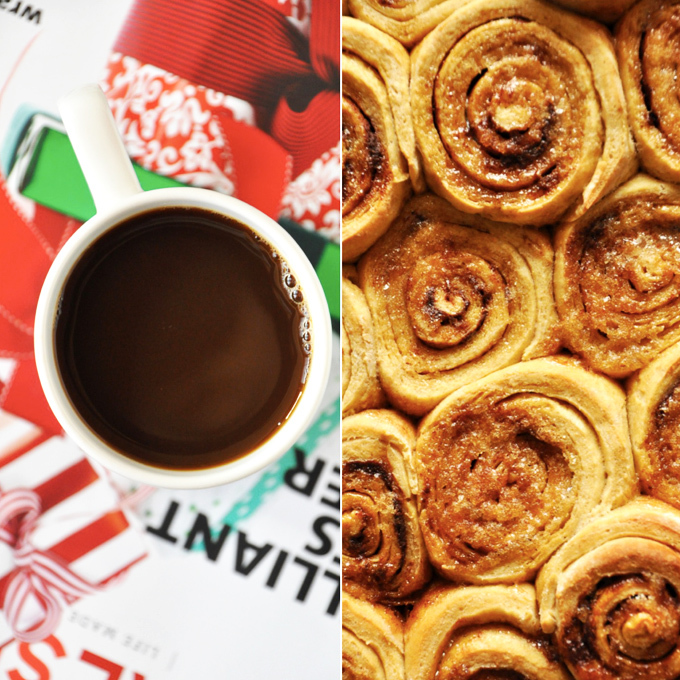 These rolls are perfect for Christmas, which I intend to celebrate joyfully this year – twinkly lights, homemade ornaments and ooey gooey cinnamon rolls all in tow. I wanted to share a Christmas morning recipe that took the stress off Christmas Day and shifted it to the night before – you know, when Santa and his elves are churning. Seems like an appropriate time to be cranking out Christmas goodies, eh? These rolls are simpler than most because they’re prepped the night before and require one mixing bowl for the entire process. All that’s left to do in the morning is a quick rise, preheat, bake, glaze and voila: breakfast is served. Now all that’s left to do is open presents and lounge. Sheesh, life is rough. I included two glazes because I believe options are not only a privilege but a right, says the girl who mixes three cereals and two milks in every bowl. I preferred the vanilla but I guess I’m somewhat of a cinnamon roll purist if there ever was such a thing. However, the bourbon caramel glaze is just as temping and you probably already have some on hand if you whipped up a batch when I shared the recipe two weeks back. If you didn’t, well, you should. It requires just 4 ingredients, 15 minutes and will probably change your life. These babies were absolute perfection and more healthy than the average roll thanks to whole wheat pastry flour and limited butter. They are sturdy but moist, just sweet enough with the brown sugar-cinnamon filling, and perfectly frosted for that optimum bite with each fork full. Gee, I could’ve devoured three…or maybe I did. 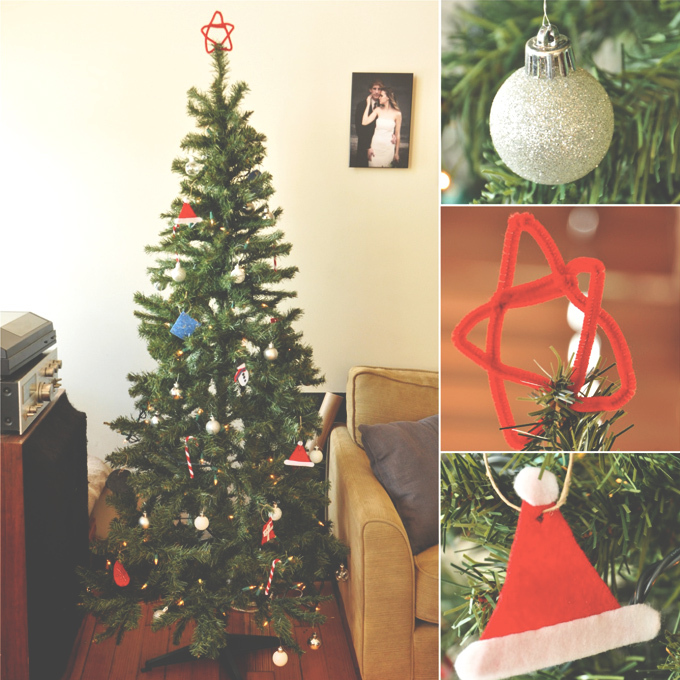 In any case, I hope your holiday celebrations are grand! Merry (early) Christmas from our little nook to yours. 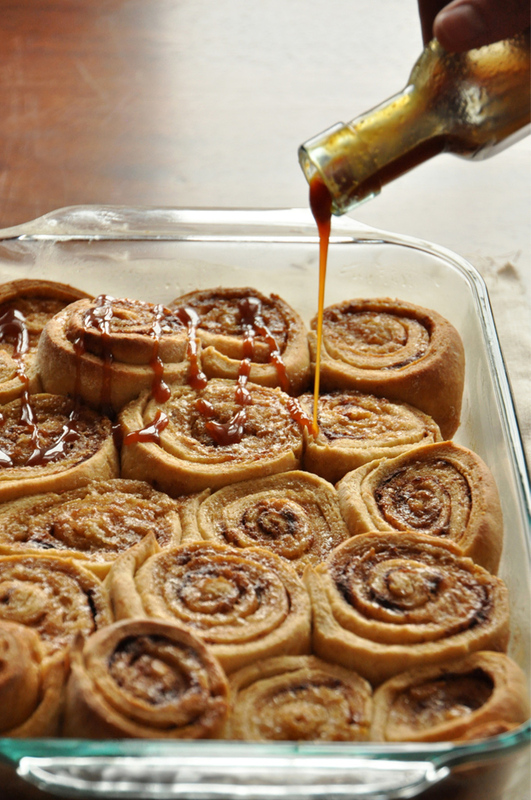 Now let’s all get cozy with some honey wheat cinnamon rolls, shall we? I was hoping you’d say yes. 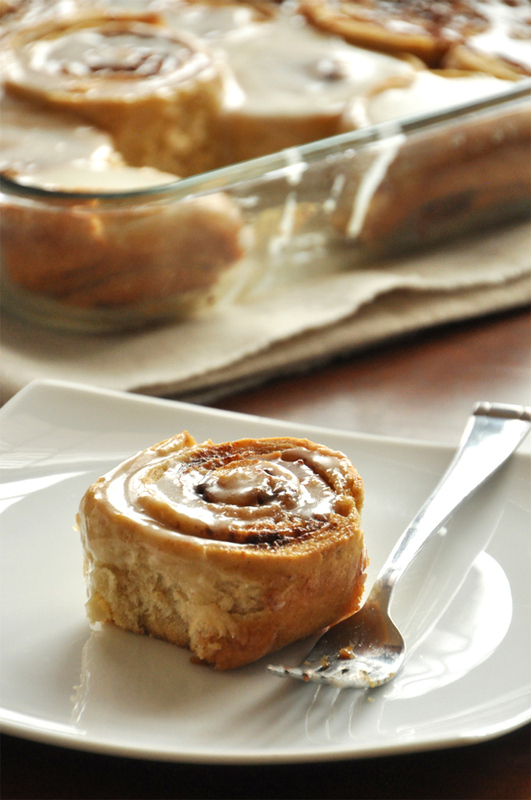 Overnight honey wheat cinnamon rolls make for a carefree morning breakfast. And whole grain flour and honey keep these rolls on the healthier side. Sprinkle the yeast over warm water and allow to bloom for a few minutes, then whisk until smooth, adding in 1/2 cup of the flour (amount as original recipe is written // adjust if altering batch size). Cover with plastic wrap and let stand in a warm spot for about 15 minutes. Add the eggs, honey, and salt and stir, then add remaining 3 1/2 cups flour (amount as original recipe is written // adjust if altering batch size) to the mixture. Mix until well incorporated and then transfer to a lightly floured surfaced. As you knead add the 1/4 cup softened butter (amount as original recipe is written // adjust if altering batch size) to the dough and continue kneading, adding flour to reduce stickiness when needed until the dough is smooth - 7 to 10 minutes. Cover bowl with plastic wrap and let rise until doubled - about 1 1/2 to 2 hours. Butter a 9x13-inch baking dish and transfer the dough to a floured work surface. Roll out into a large rectangle and brush with 1 1/2 Tbsp melted butter (amount as original recipe is written // adjust if altering batch size). Sprinkle the brown sugar mixture over the butter and then starting at the long side covered with sugar, roll up the rectangle as tightly as you can and pinch the seam together as the dough allows. With the seam facing down, cut into 15-18 equal pieces (~2 inches), depending on how tall you want them. Place the rolls in the dish and cover with plastic wrap. Let rise in the refrigerator overnight. Rinse your bowl for making the glaze in the morning. In the morning remove rolls from the refrigerator and let rise until nearly doubled, about 1 hour. Preheat oven to 350 degrees F (176 C) and bake until golden brown, about 20-30 minutes. Let cool in the pan for 15 minutes. While the rolls are baking, prepare the glaze: Melt butter in your mixing bowl and then whisk in the milk, vanilla, and powdered sugar. Whisk until a smooth paste forms adding more sugar as needed. Spread the glaze over the warm rolls and serve immediately. Store in an airtight container to keep fresh for several days. Hi! While kneading will take a bit of elbow grease and can be tricky, if you find the dough to be too dry, you can add a bit of water if need be. Just be sure not to add to much or it will become sticky and hard to knead. Hope this helps! Hello! I am making this as I type…but I’d prefer to bake them the same day. Can I go ahead and bake them right away after they are assembled in the pan or do they need some time to rise again? If so, for how long? WOW! I made this with my 5 year old. I used half regular whole wheat and half cake flour and sugar in place of honey. I drizzled caramel and white chocolate glaze. Simply amazing! Your recipes have taken my baking to a whole new level! Not sure where I went wrong here I’m very thorough and usually get it spot on. can i use coconut oil as a substitute for butter? they look s good, can not wait to try them! I believe that could work for the filling and the glaze, but not so sure how it will turn out in the dough! Let us know if you try it! Oh no! Am making these now but am worried about the yeast measurement. I put in 1tbsp yeast as directed in the recipe. However, just realized that 1 package yeast usually equates to about 2 1/4 tsp. Is all the extra yeast going to ruin the recipe? These rolls were delicious! The dough was not very sweet which was nice since the cinnamon sugar filling was plenty. I used 3 cups whole wheat pastry flour and 1 cup of regular whole wheat flour since I ended up running out of the pastry flour. After step 1 I put everything into the bowl of my kitchen aid mixer and let it go for about 5-7 minutes using the dough hook. The dough was extremely sticky so I added about 2 additional tablespoons of flour to the mixture which didn’t seem to change the consistency very much. I decided to leave the dough as it was and just cover it and let it rise. After the 2 hours it was still very sticky and hard to get out of the bowl. After flouring my hands and both sides of the dough I was able to roll it out. I was able to get 16 rolls out of the mixture which filled up about 2/3 of my 9×13 pan. The rolls didn’t seem to rise or change much in the refrigerator overnight or when they sat out on the counter for the 1 hour before baking. The baked up perfectly though and ended up filling out the entire baking dish. Do you think I can substitute the butter with coconut oil? wait, so how much yeast? each packet usually has 2 1/4 tsp, and it says (-1 tsp), so do i use 1 tsp, or 1 1/4 tsp? Tia, I will amend that to say 2 1/4 tsp, as I believe that’s how much one standard packet contains. So, use 2 1/4 tsp! These were great! I used more butter when I spread the sugar and cinnamon on. One major note: I checked on them after 20 minutes of baking and they were a little overdone. :( So definitely check on them around 15 minutes. I’m not sure how they could be baked for 30 minutes. Thanks for the tip, Michelle! I think I’ll add that in the notes. Glad you enjoyed them! Just made these cinnamon rolls and they are delicious!!! I just followed the recipe step-by-step and everything worked out. Thank you, I will definitely be making these Christmas Eve!!!! Where do you find whole wheat pastry flour? I have only been able to find whole wheat flour. You can find it at health food stores and stores with bulk bins, usually. Or you can use this tip from Faux Martha to make your own! Just wondering if anyone has made the dough ahead of time and frozen it to bake later….. any tips on this? at what stage would you freeze it? I’m a new subscriber and LOVE your blog (and I’m sure, by proxy, you)! I’m also newly dairy free/gluten free–not by choice. I’ve been eyeing this recipe and dying to try it. Do you have any ideas about how to do these gluten free? I’m an avid baker and have come to trust my Earth Balance for the butter issue, but gluten free flours are intimidating. There are so many! Any suggestions? I tried these this weekend. My mother loves cinnamon rolls and her birthday was coming up. Now I’m not a frequent baker and rarely use whole wheat flour for anything other than bread so my ignorance may have caused the problems I encountered. If you can tell me where I went wrong, I would be very grateful. First off, my dough was sticky. I added more and more flour a little at a time and it seemed to take a lot before the dough wouldn’t stick to everything. I’m guessing I might have added another 1/2 cup before it acted like a dough meant to be kneaded rather than one meant for drop cookies. I also mixed in the extra flour using my hands. I was starting to worry that I was overhandling the dough so when it was finally kneadable, I only kneaded for the 7 minutes rather than the 10. The dough rose like a champ so that made me feel better. The second problem was when I took the cinnamon rolls out of the fridge to rise for an hour before baking. They didn’t really rise. The bottom of my 9×13 dish was pretty cool. I gave them another 10 minutes and set them on the stove to get some residual heat from the oven warming up but they still didn’t rise much. I baked them anyway. 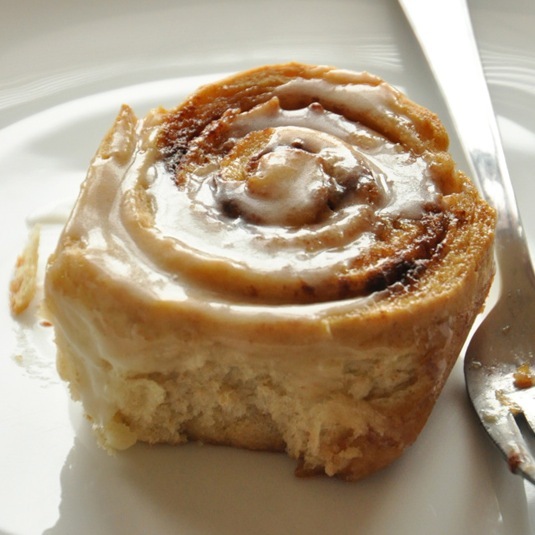 One of the magic things about cinnamon rolls is how the outer edge gets just a little crisp, but as soon as you’re past that paper-thin bit, the rest of them are soft and oh-so-good. Mine had the perfect amount of sweetness but seemed a little grainy and way too dense for cinnomon rolls. Maybe this was the add’l flour I added, maybe it was the extra handling, maybe it was the lack of rising before baking. Or maybe this is just standard whole wheat pastry flour. My Mom said she’d eat another roll so I set aside some for her but I threw the rest of them out. If I were to do these again, what should I do differently? Thank you! Elizabeth! Sorry to hear about your difficulties with this recipe. It’s hard to tell exactly what went wrong with your rolls. The overworking may have done it…or the extra flour. I’m not sure! cinnamon rolls and similar doughs are sometimes a little finicky and I don’t know what fault to offer besides an ingredient malfunction or unclear instructions. If I hear from anyone else that they had trouble with this recipe I’ll gladly try it again to troubleshoot. Thank you so much for responding. I’ll give them a try another day. These sound divine. Do you have any suggestions for an alternative to egg? As My family and I dont eat egg for health reasons. Hmmm, perhaps flax eggs (1 flax egg = 1 Tbsp flaxseed meal + 2.5 Tbsp water)? Let me know if you try that and how it turns out! 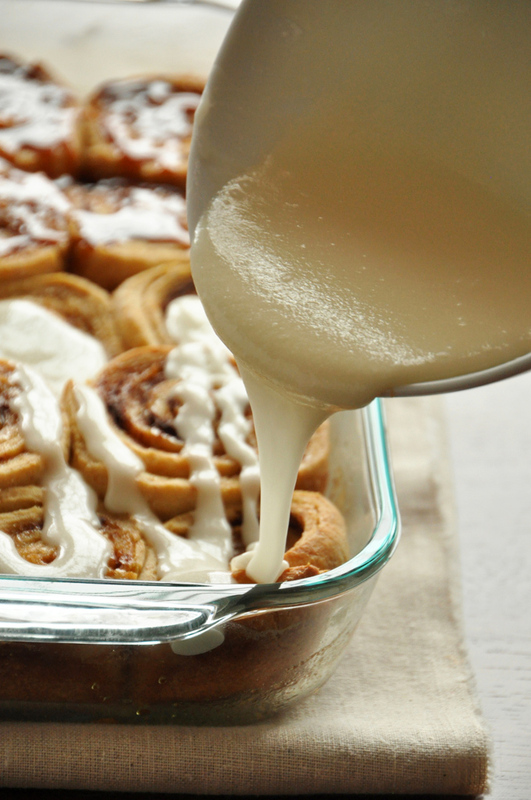 This recipe will be my first attempt at cinnamon rolls from scratch. But, I’m going to try to wing it with my regular yeast instead of rapid rise since I have time on my hands this summer. I might also try to sweeten it with agave nectar — my taste-testing friends probably won’t mind a few trial and error batches! why 4 eggs? most recipes call for 1, does it make them fluffier? Yum! I want to try make these this weekend, but wondering if I can use regular whole wheat flour and not whole wheat pastry flour? Yes! You can. But they may turn out slightly more dense! I’d recommend splitting it half & half with all purpose if you can. Hope that helps, Erin! These look divine! 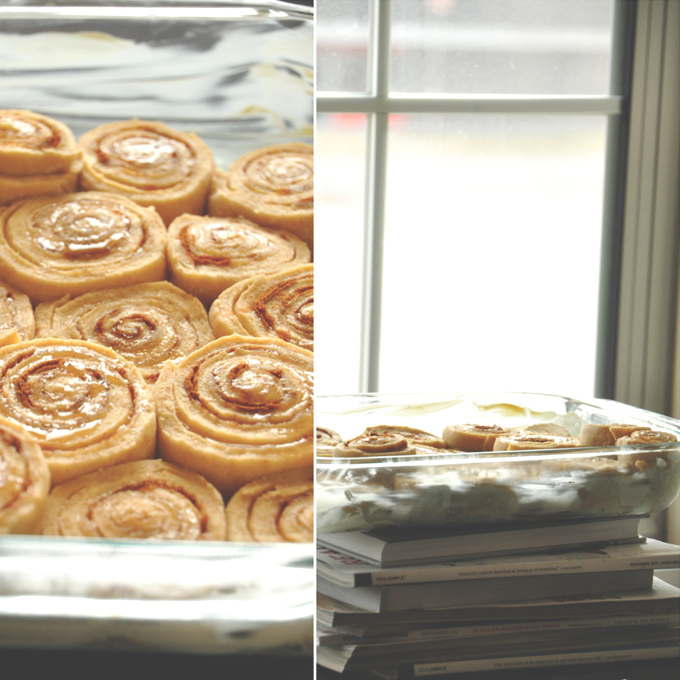 They will be perfect for when my in-laws are coming over for tea this weekend – my dad-in-law is a cinnamon roll lover, and no fuss for me. Thanks for the recipe! Is there anyway you can recalculate the ingredients to yield 6-7 rolls? 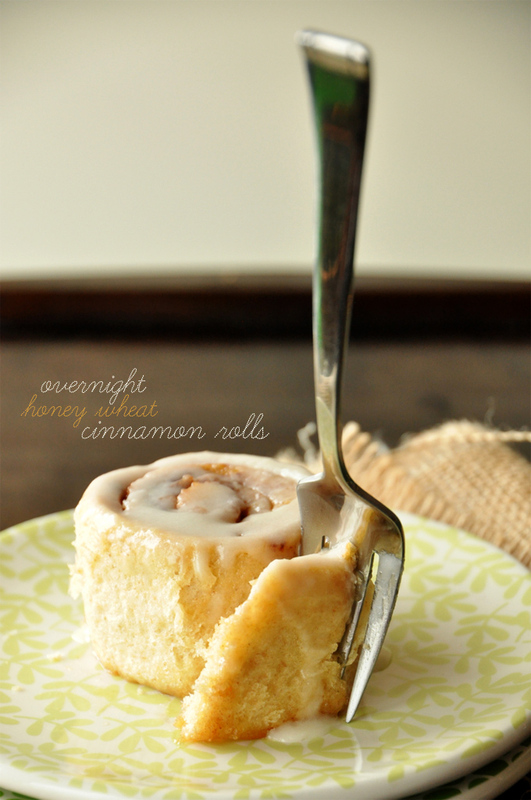 I love the idea of overnight cinnamon rolls! I pretty much always do my baking late at night anyway! 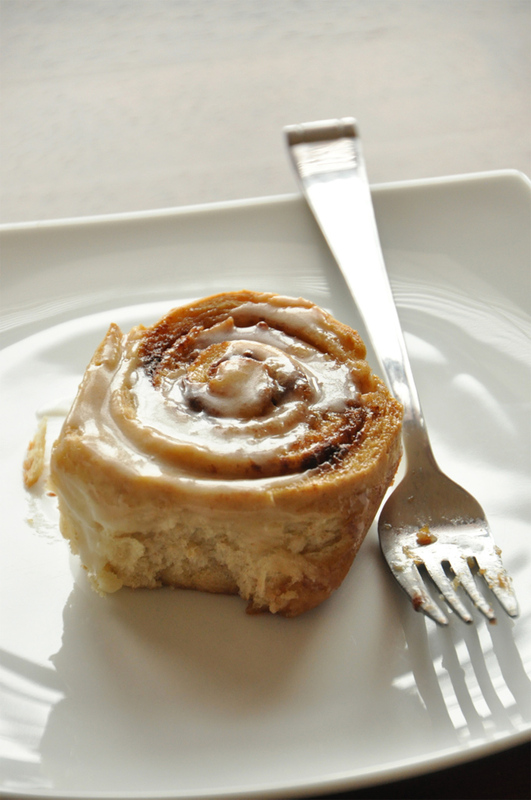 But If there’s one thing I don’t want healthy-fied it’s cinnamon roll! These look amazing! I’ve always wanted to make an overnight cinnamon roll, but there was too much morning prep. (They wouldn’t get done until noon!) Any suggestions for a vegan version? Beautiful! Love that these use whole wheat and honey, and two glazes. Yum! Did you mean *pastry* flour or hard whole wheat flour? Will the rolls rise with whole wheat pastry flour? I meant whole wheat pastry flour, as noted in the ingredients list. And yes! They rise with whole wheat pastry! Oh wow. This looks so delicious! Beautiful photos also.. These are truly capturing my heart right now. When I make these, I will tell myself that they have to be healthy because of the wheat and honey right? Great shots! These look ever so tempting…. I love that these are vegan! The fact that you were able to make them with entirely wheat flour and get such good rise out of them is so impressive! And love that you’re an options girl – me too. And with frosting, the more the merrier! Uhhh, yes. Please!! Great lighting in these photos. They look absolutely perrrfect!